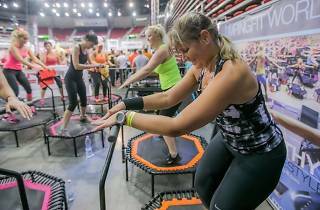 Bounce and bop your way to a killer bod at this jumping rave that combines specially designed routines on mini trampolines with a live DJ set, glow sticks and more. The hour long sessions blend fast and slow jumping, traditional aerobic steps and dynamic 'power sport' elements for a full body workout. Visit the Jumping Rave event page to book in advance.